Spring is so beautiful here in the Hill Country of Texas and so full of tree pollen--Achoo! I decided to celebrate spring indoors with my really great air filter running. For a special surprise I've chosen to try voice over on my process video while I have such bad allergies. It kind of helped my not worry so much about perfection. I'm a member off the amazing Facebook group Dina Wakely Mixed Media Tribe. The members are encouraging and positive and I really enjoy them. Every month Dina offers a prompt if you wish to play. The prompt this month is square. I do love a geometric page especially if I can use scraps from my scrap boxes. 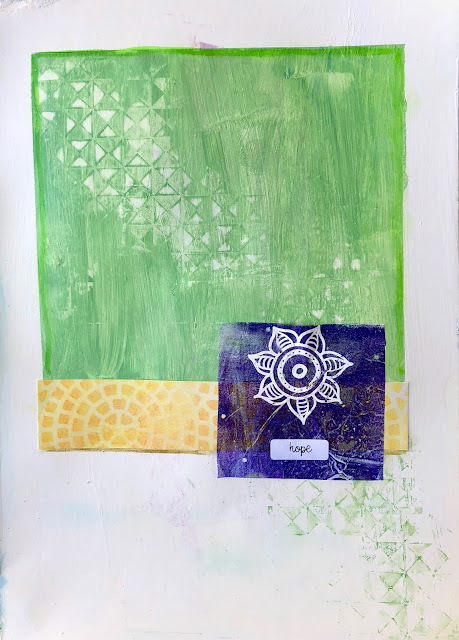 Here are a few other geometric journal pages. Some of my scraps used include mono prints from Birgit Koopsen's gel plate challenge. Click here for more info. Joining a mixed media group or craft group is very encouraging. I hope you try at least one of the two I've mentioned. If you know of a great one, please share in the comments. Thanks! PS. Want to peek at my Etsy store? Click here.